I love to try new makeup but sometimes do not have the extra funds to fork out $30 for a new lip color. I also do not want to waste a ton of money on cheap beauty products. 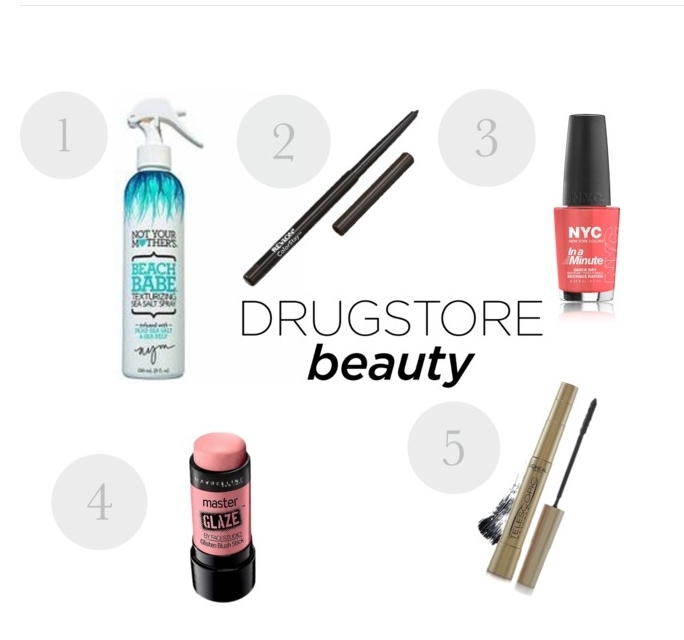 Here are my favorite drugstore picks, tried and true! What are your favorite drugstore products? 1. Not Your Mother’s Beach Babe Spray: Love this stuff! It smells like the beach and really gives natural tousled waves in just a few minutes. I usually use this on a lazy hair day, spray in damp hair and tousle my hair with my fingers. 2. Revlon Colorstay Eyeliner: I have been using this eyeliner for years. It lasts ALL day and does not smudge. It’s also easy to apply. The classic blck noir is my go-to, however they have some fun color selections if you;re feeling frisky. 3. NYC In a Minute Nail Polish: For $1.99 you can have fun with color. Dries quickly and pretty good quality for the price! Fashion safari is the perfect beach inspired color for summer. 4. 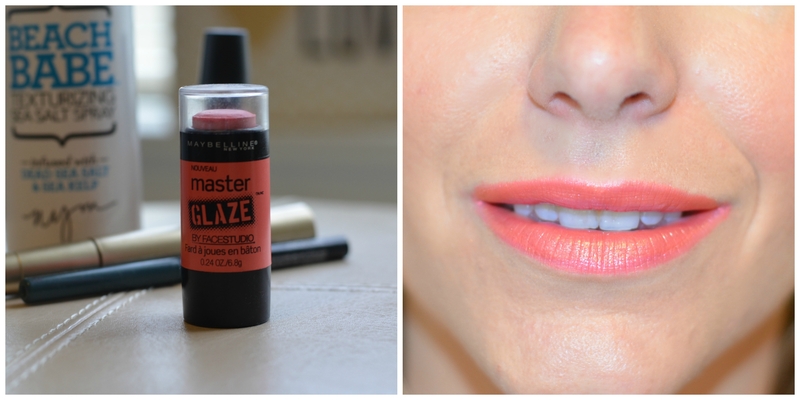 Maybelline Master Glaze Blush Stick: This is technically a blush, however, you can see that I used on my lips as well. I love when a product can dual as two beauty products, especially for on the go. It’s very moisturizing and I love the Coral Sheen color. 5. L’oreal Telescopic Mascara: By far the best drugstore mascara I have tried. I was really impressed with the way it lengthens and thickens lashes.. I did not even need eyeliner when wearing this mascara (as seen above). Perfect for an everyday mascara. I love Not Your Mother’s Beach Babe! Beach babe is the best! Great post! 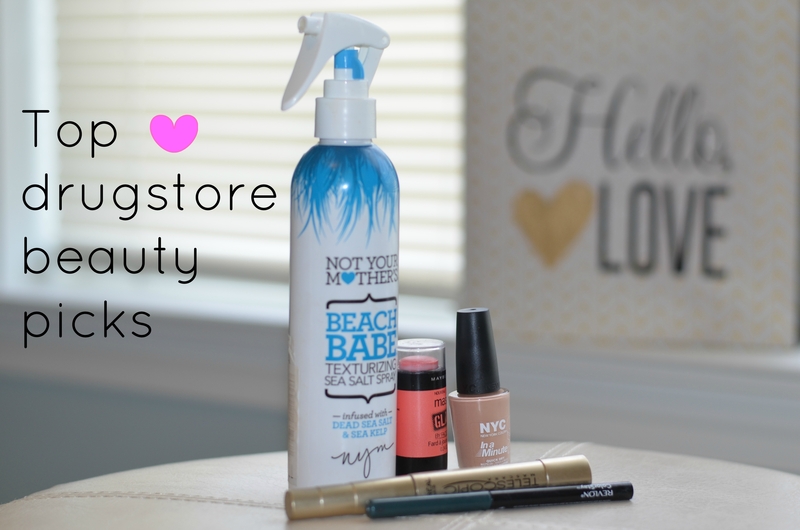 I love these products, it is always good to know what drugstore brands to get! Thanks for sharing love! I definitely want to try that beach babe spray! Your skin looks so dewy and fresh! Love the look! I really want to try the beach babe spray! Thanks for sharing! I love that nail color! I’ll have to try it! Love the color of that NYC nail polish, great list! I own one of the Master Glaze blushes + didn’t even think to use it as a lip color! It looks really pretty on you. I also need to pick up that mascara as well. NYC makes good polishes, but my favorite drugstore brand with polish is wet n wild. they’re only $1.99 and are AH-MAZING! Love Beach Babe.I’ll have to try the mascara. The mascara worked so well on you! It was a bit more clumpy on me, which was disappointing. I’m sorry to hear.. do you have any drugstore fave mascaras? can’t believe how awesome that blush stick works as a lipstick! 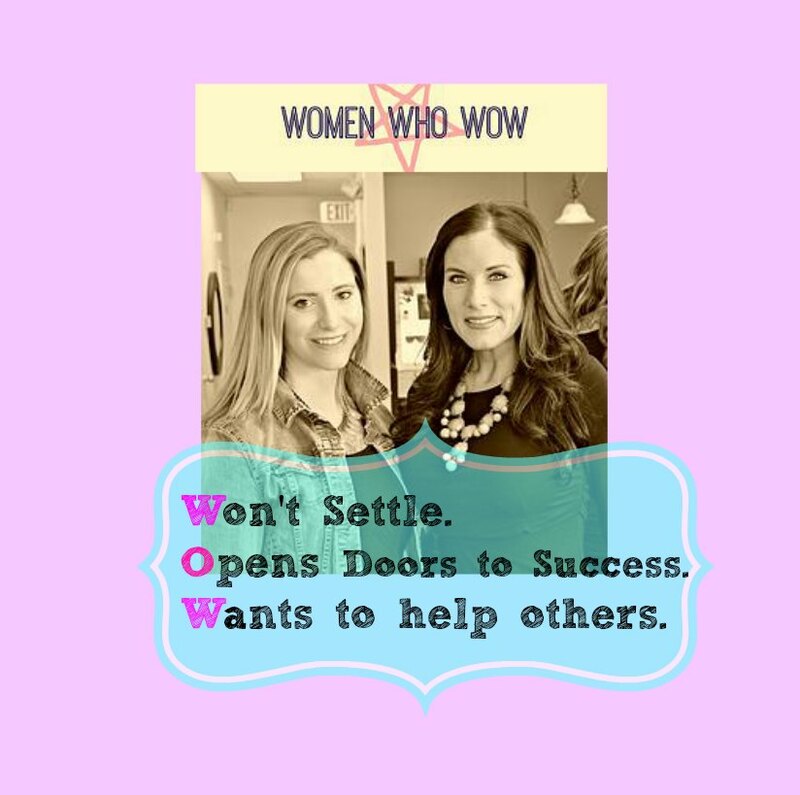 I’m totally wowed! 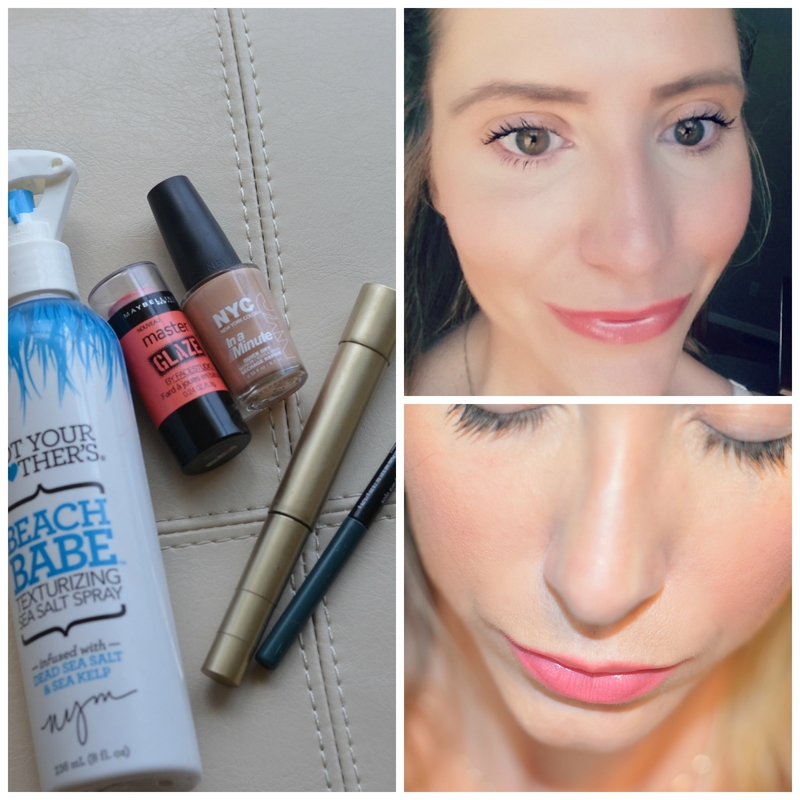 thanks for sharing your drugstore beauty finds!